Websites such as TripAdvisor are putting pressure on the hospitality industry to offer an unrivalled customer experience. This is seeing the sector slowly starting to branch out from simple push-to-talk radio communications towards applications that increase operational efficiency, such as job ticketing. This is in addition to the use of two-way radios to improve safety and security, especially when deployed on large sites. It is with this in mind that applications for two-way radio in the hospitality sector include integration with fire panels and the ability to use GPS tracking to keep lone workers safe. One example of two-way radio improving efficiency and customer safety in hospitality is Bovey Castle, a high-end hotel set in a former manor house. The hotel’s estates team uses Land Rovers. In the past, guests taking part in the hotel’s off-road experience were out of range, so the radios would not work in the event of an incident. This led Bovey to ask its supplier, Premier Communication Electronics (PCE), to deploy around 12 Motorola DP1400 radios with an antenna system and repeaters. As part of this, according to Alan Macdonald-Brown, technical sales consultant at PCE, the venue now has radio coverage in the event of an incident. Bovey can scale up the deployment if necessary: PCE was able to supply a total of around 20 devices when the venue was hosting a high-profile wedding. Another venue that wants to talk efficiently to enhance safety and security is heritage site Down House, which was formerly home to scientist Charles Darwin. The site’s team was able to greatly improve its operations and better manage visitor flow by using Hytera PD505 handsets supplied by Dover-based radio company Smye-Rumsby. By switching from analogue to digital radios, the site gained access to a number of additional features, including two voice paths per channel and background noise cancellation. This allows users to make two simultaneous transmissions with enhanced call clarity. She says this often sees radios deployed alongside pagers. Nixon cites the example of the Slug and Lettuce, part of the Stonegate Pub Group, which uses Hytera Power446 two-way radios to link the kitchen to the restaurant staff. Meanwhile, customers are issued with a pager when they enter the restaurant and ask for a table. Andy Bird, general manager at the York venue, says the system has allowed more people to be served each day. Meanwhile, the restaurant chain Dishoom uses FYSTEC radios, TableScouts and DineTime software, supplied by Call Systems Technology (CST), to increase its efficiency by getting customers seated quickly. “They are looking at which tables have become available while reviewing the waiting list. At the same time, Dishoom’s staff are using the radios to speak to their colleagues, who are outside the restaurant with the clients queuing for tables, so they have real-time information coming in,” Eloise Sheppard, managing director at CST, says. Another part of the hospitality industry with varying needs is the catering sector. For example, Wise Catering, which provides hospitality services to sporting and music events, uses Icom IC-F2000D digital two-way UHF hand-portables. With seasonal peaks and events that can require up to 300 staff, the company operates in a very fast-paced and pressurised environment. Chris Treacher, managing director of Wise Catering and Events Bar Management, says two-way radios are reliable and help to improve customer service. Although hospitality covers an enormous set of requirements – from B&Bs to huge resorts containing hotels and sports centres – the underlying things they want are better efficiency, improved customer service and physical security, Fitzgerald says. For example, DMR technology offers improved clarity – especially across extensive coverage areas – improved battery life for longer shifts, and additional safety and emergency features. As they realise that the benefits of two-way radios are not just limited to talk, hospitality venues are branching out, looking at new features that integrate their devices with various internal applications. Mike Syrett, account manager at Smye-Rumsby, says most of his hospitality clients are using radios simply to talk, but they are starting to add safety applications. “The radios are usually just used for communications – but some of the systems we put in now are linked to the fire alarm.” For example, he says, if a fire were to start in a hotel, marshals could be alerted of the location where the alarm was set off. This would save time because there would no longer be any need to physically go to the alarm panel. And false alarms are very expensive to hotels. The refund rate for a hotel that is emptied at night for a false alarm is 80 per cent, so integrated panels represent “huge return on investment”, says Sheppard. Meanwhile, he says, there are different ways of doing location tracking to suit the needs of a venue. “GPS doesn’t work particularly well indoors, so recently we are seeing RFID and Bluetooth solutions, with Bluetooth-enabled iBeacons. In addition, the sector is asking for the ability to use radios even outside the hotel, which is leading to integrated connectivity. Fitzgerald says Motorola’s unified communications offering allows companies to link their radio system to the solution. “If a general manager wants to be able to always contact people, he can install an app on his mobile phone and, as long as he is on Wi-Fi or the cellular network, he can speak to the system – so you can extend where radio coverage goes. The needs of the hospitality sector are so varied that no single radio solution can suit them all. However, innovative applications are emerging all the time and it is these that could be a much-needed aid to companies seeking to get ahead of the pack in this increasingly competitive sector. 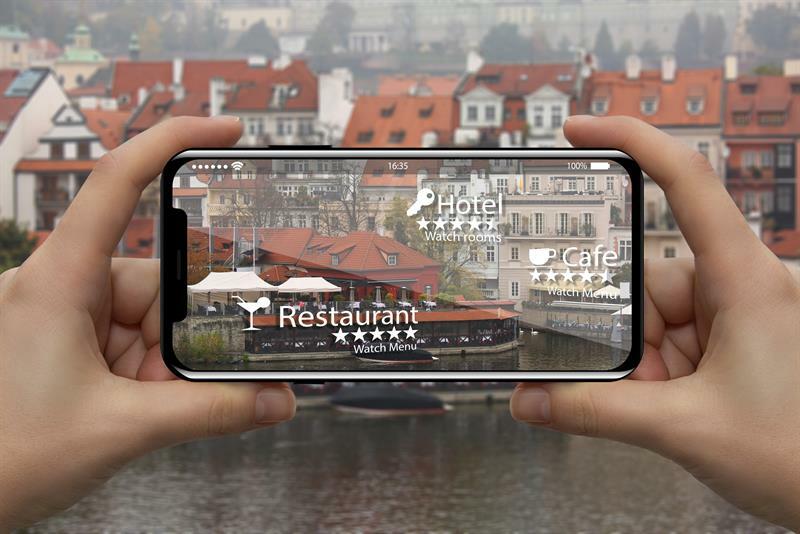 In addition, AR can offer a ‘companion experience’ in hospitality. “Mobile apps that overlay historical events on existing sites could well become key value-adds for the big hotel chains,” says Allison. Augmented reality can also show clients what a conference room would look like at an event. Meanwhile, wearables have the potential to be used to identify guests, providing useful background information to help the hospitality sector to better serve visitors.